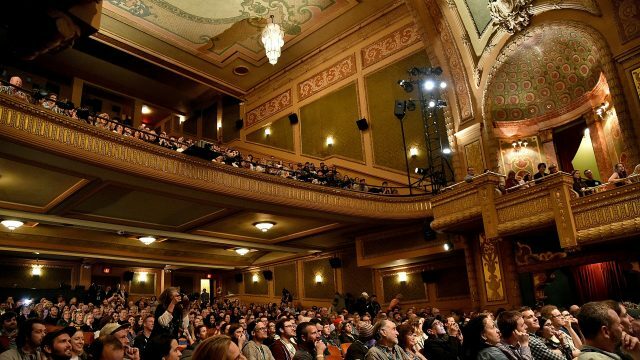 The SXSW Conference and Festivals announced the 2018 Jury and Special Award winners of the 2018 SXSW Film Festival Awards Presented by FilmStruck at the historic Paramount Theatre. The awards were hosted by actor and comedian Jim Gaffigan. Feature films receiving Jury Awards were selected from the Narrative Feature and Documentary Feature Competition categories. Films in competition categories, as well as all feature categories (with the exception of Special Events) and the Title Design Competition entrants, are also eligible for the 2018 SXSW Film Festival Audience Awards. All Audience Awards will be announced separately on Saturday, March 17, except for Headliners, which will be announced on Monday, March 19. SXSW also announced the Jury Award winners in the Shorts Program and winners of the SXSW Film Design Awards Special Awards including the Louis Black “Lone Star” Award, the Karen Schmeer Film Editing Fellowship, and the SXSW Adam Yauch Hörnblowér Award. The SXSW LUNA® Gamechanger Award – Narrative and SXSW LUNA® Chicken & Egg Award – Documentary were also presented, including a $10,000 artist award and mentoring to help female filmmakers hone their craft in the fiction and documentary categories, seek new and exciting opportunities, and navigate the changing media landscape. Over the course of nine days, the 2018 SXSW Film Festival will screen 136 features, consisting of 89 World Premieres, 13 North American Premieres, and 6 US Premieres, with 49 first-time filmmakers. 98 shorts and 20 music videos will screen as part of 12 curated shorts programs. The 256 films were selected from 8,183 overall submissions, consisting of approximately 2,476 features and 4,433 shorts. Take a look at our 2018 SXSW Film Festival Award Winners! Presented by Vimeo. Vimeo empowers video creators of all kinds to tell exceptional stories and connect with their audiences and communities. The SXSW Film Awards are presented by FilmStruck. FilmStruck is a new streaming service for serious film fans, offering a comprehensive library including indie, contemporary and classic art house, foreign and cult films. It is the exclusive streaming home of The Criterion Collection.